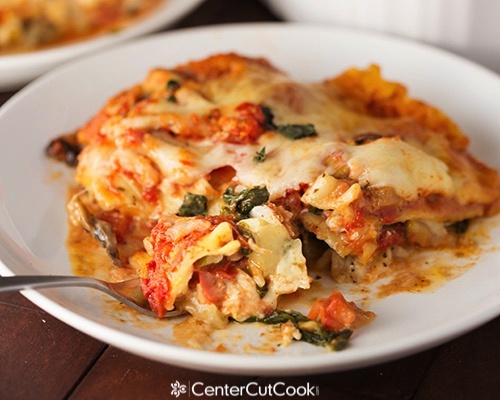 Hearty Cheesy Vegetable Lasagna with tomato sauce, cream sauce, and plenty of mozzarella cheese! Oh hey you! Yes I am talking to you, the lasagna lover out there who adores nothing more than a big hearty slice of lasagna, perhaps the four-cheese variety with layer upon layer of cheese, sauce, and meat! I used to be in your boat too, thinking that the only way to eat lasagna was if there was Italian sausage, or ground beef, or even ground turkey in the mix. And then…. I got wild and crazy and decided I’d swap out the meat and replace it with veggies. Even my meat-loving husband who once turned me from a vegetarian into a meat-eater again (true story), exclaimed that he did not even miss the meat! 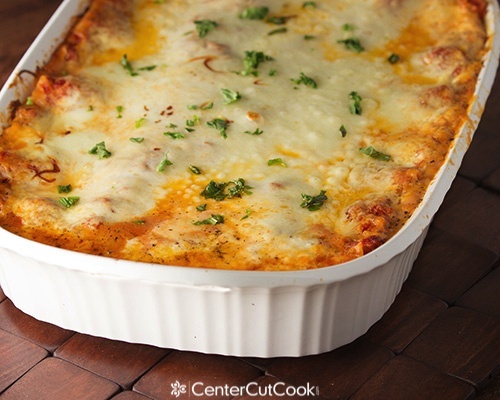 You are absolutely going to love what goes into this lasagna…. 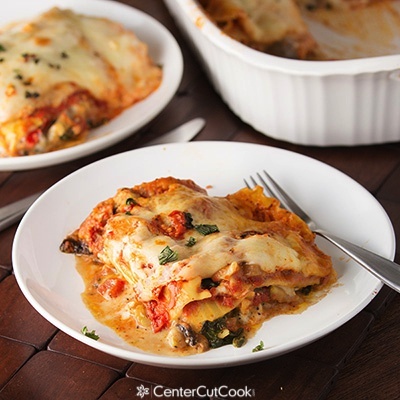 lots of cheese, lots of veggies, a tomato sauce layer, a cheesy creamy layer, and plenty of cheese! Let’s talk about the tomato sauce layer. For starters, feel free to use pasta sauce (spaghetti sauce) from the grocery store. This sauce requires no pre-cooking and comes together quick. You just toss a few ingredients into a bowl, stir, and it’s ready. The same goes for the creamy cheesy layer. A few ingredients get stirred together and it’s ready to go. The only thing that might catch you by surprise is the fact that there’s heavy cream in the cheesy layer. This was a first for me, but it works! The “hardest” part about this Hearty Cheesy Vegetables Lasagna, and it’s really not hard, is the vegetable layer. It’ll take you about 10 minutes to prep the veggies and then about 5-10 minutes to sauté ’em in a pan so that they’re tender. 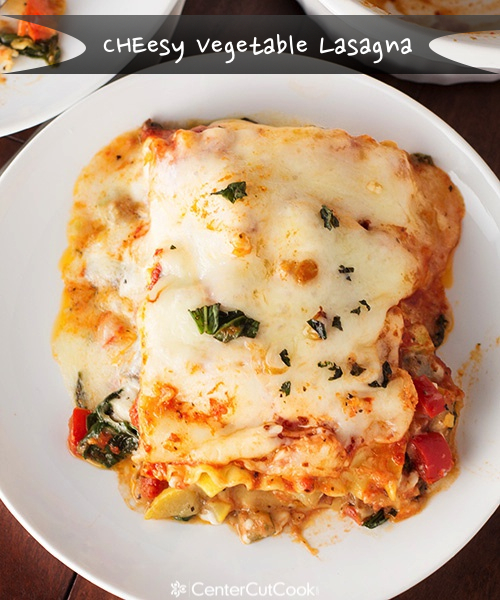 I can’t think of a more perfect time than summer to make Hearty Cheesy Vegetable Lasagna with so many fresh vegetables in season. I am always looking for more meatless meals, and this one was definitely a hit. In a large bowl, combine all of the cream sauce ingredients. Set aside. In a large bowl combine all of the tomato sauce ingredients. Set aside. In a large non-stick skillet heat 1 tablespoon olive oil over medium heat. Sauté zucchini, squash, red peppers and mushrooms until tender. Season with 1/2 teaspoon salt and 1/2 teaspoon black pepper. Remove the vegetables from the pan and set aside. Heat a bit more oil if needed. Add the spinach and cook for a few minutes, until it is wilted. Add in 4 cloves of minced garlic and cook for just a minute or two, until fragrant. 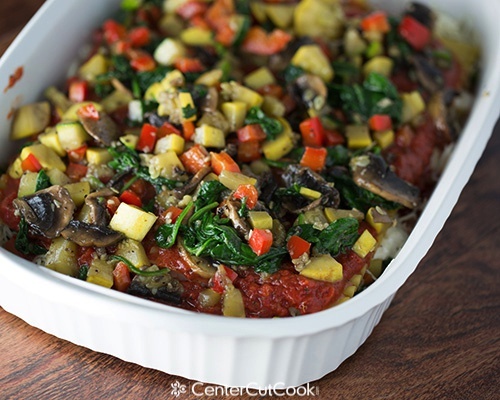 Return the cooked zucchini, squash, mushrooms, and peppers to the pan and toss together with the spinach and garlic. Check the seasoning and add more salt if needed. Spray a large 9 x 13 inch casserole dish with non-stick cooking spray. Spread 1 cup of the tomato sauce over the bottom of the dish. 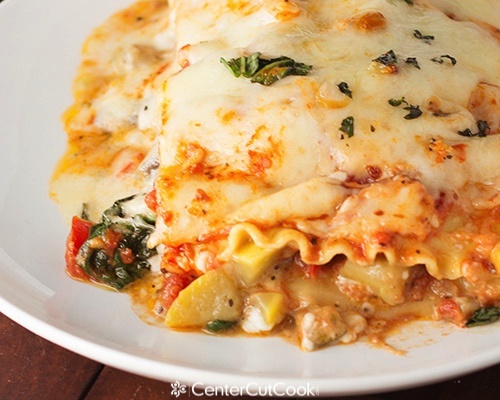 Arrange 4 lasagna noodles. Divide the vegetable mixture in half and spread it over the noodles. Top with half of the cream sauce and 1 cup of mozzarella cheese. Add another 4 noodles, 1 cup tomato sauce, the other half of the vegetables, the other half of the cream sauce, and 1 cup mozzarella cheese. Arrange the last 4 noodles on top. Spread the remaining tomato sauce over the noodles. Top with remaining two cups of mozzarella cheese. Spray foil with non-stick spray and cover the lasagna. Bake for 45-50 minutes, or until the cheese is starting to bubble. Remove the foil and cook for about 10 minutes longer. Cool for 10 minutes, sprinkle with 2 tablespoons chopped fresh basil, then serve.